Influential human rights activists dies without learning fate of her husband, two children and pregnant daughter-in-law who were forcibly disappeared during the country's dictatorship. 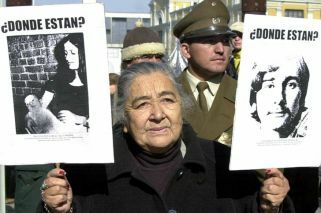 One of Chile's leading human rights advocates died Friday at age 93 without knowing the fate of her husband, two children and pregnant daughter-in-law who were forcibly disappeared during the country's dictatorship. Ana González died in a hospital in Santiago after years of suffering from breathing problems. González spent more than four decades searching for her loved ones and the more than 3,000 people who were killed or disappeared during general Augusto Pinochet's 1973-1990 dictatorship. She fought fiercely against the dictatorship and had addressed the United Nations, the Organisation of American States and many others about human rights abuses. Her family members disappeared in April 1976. Her daughter-in-law, Nalvia, was kidnapped when she was three months pregnant. Then, dictatorship agents came after González's sons, Luis Emilio and Manuel, and her 2 ½ year-old grandson, Manuel. González continued to attend human rights demonstrations until recent years. "She dedicated her life to seeking the truth and finding justice for the crimes that she suffered in her own flesh," said Consuelo Contreras, head of Chile's Human Rights National Institute. In an emotional video posted on social media, UN Human Rights Chief Michelle Bachelet also paid homage to González, holding back tears. "You will remain in the hearts of thousands of Chileans for your selfless struggle for the rights of all," said Bachelet, a former Chilean president who was tortured and fled her country's dictatorship into exile.